Join the discussion on our forums! Come discuss Spirit Echo over in our dedicated Spirit Echo discussion topic. 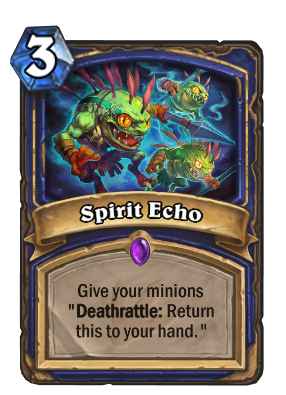 Spirit Echo returns the card to your hand. By the time the second deathrattle triggers, the minion is already in your hand, so the effect does nothing. I've noticed that when Baron Rivendare is on the board and a minion with the Spirit Echo Deathrattle that only one of the minion is returned to your hand. I'm thinking perhaps that might be the correct result because the Deathrattle is "Return this to your hand" rather than "Return a copy of this to your hand." Since there is only one "this" (i.e., the minion) then only one minion can be returned to your hand regardless of the presence of Baron Rivendare. Interested in others' thoughts. I've played vs around 15 murloc shamans already at rank 10 and none of them play Spirit Echo, why? Because it's a bad card? Probably because the card is too slow to fit in a murloc shaman. On top of that, Giantfin will refill their hand just fine, they don't need spirit echo for more value. This could have made The Caverns Below viable if was made for rogue......in Shaman it will be extremely powerful unless priest start teching Mass Dispel to make it a wasted 3 mana. I guess against priest the go to play would be cast this then trade as many creatures as possible to refill your hand. Jesus Christ, you are wrong. In my opinion, it is basically a win-more card: If you have board control and your opponent doesn't AoE next turn, most of the times you do not need this card. If you have played evolve, you also do not need this card except for very occasional situation (i.e. playing vs a paladin who will eq+consacrate next turn) If you do not have board control, you will most of the times play this card with little value for its cost (3 mana) - e.g. deathrattling a totem and a Thing from Below. Does this card make Windspeaker playable? You play your Thing from Below, Flame-Wreathed Faceless, Earth Elemental and what not, turn around and give them Windfury, and then cast Spirit Echo so you can do it again in a later turn. Heck, if you have Thing From Below, you can play them both for really cheap. 1. Jade Shaman - this is the one where everybody is getting excited/worried, but I actually think it's overrated here. In addition to the Jade summoners, you are also going to be adding fat vanilla minions that you'll never have time to play anyway. 3. Control/Deathrattle shaman - this one's a little clearer. get yourself another white eyes... then drop n'zoth later. things like that. Judging by the art, I think Blizz was thinking on number 2 also. Could this mean that CONTROL shaman will be the new cancer of the next expansion? Probably not. What this means is that the old MID-RANGE jade shaman with the ability to re summon Aya Blackpaw, Jade Chieftain and maybe even Jinyu Waterspeaker will continue roaming the ladder and being cancerous this new expansion. Really like the card art on this one.